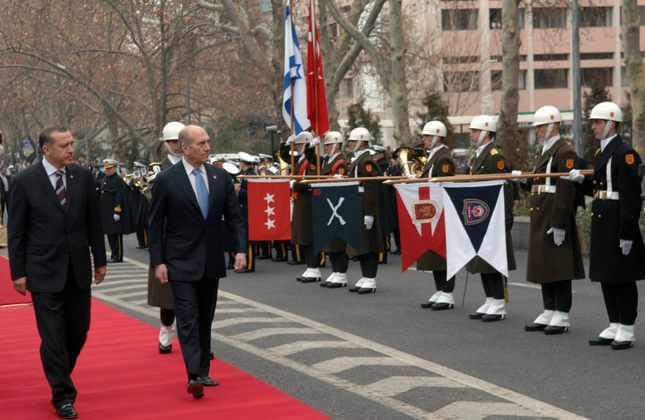 Then-Prime Minister Erdoğan with his Israeli counterpart Ehud Olmert in the welcoming ceremony during his visit to Ankara on Feb. 15, 2007. Turkey and Israel are currently in negotiations to normalize their diplomatic relations, which have been frozen since the 2010 Mavi Marmara raid when Israeli special forces killed 10 Turkish nationals on a ship carrying humanitarian aid to the Gaza Strip. Although reciprocal talks were reportedly kept behind the scenes since the diplomatic tensions began, President Recep Tayyip Erdoğan's statement openly giving a green light to such efforts for the first time since the Mavi Marmara raid hit the headlines. Considering Israel's isolation and plans to transfer Israeli natural gas to Europe, the situation is ripe for normalizing ties with Turkey, which sees this move as a step to contribute to the Palestinian cause and to gain a fresh ally in the troubled region. Turkey's being hit with two recent terror attacks in its capital and at the heart its economy within a week has become an opportunity for the two countries to establish closer contacts with each other. While Israel has for the first time condemned the March 13 Ankara bombing at the prime ministerial level after a long wait, Erdoğan conveyed his condolences to his Israeli President Reuven Rivlin for the three Israeli citizens killed in the DAESH suicide attack on Istanbul's İstiklal Avenue last week. With Rivlin's calling Erdoğan in the first high-ranking official contact for some time, the incidents have paved the way for the two countries to re-establish closer ties. As the latest attack showed, neither country is safe even for their citizens outside their borders, as terror attacks can strike at any time in any place. This development also left questions regarding whether the two countries can accelerate their reconciliation talks within the framework of cooperation in security and intelligence while entering the 67th year of diplomatic ties. As Turkey is confronting multiple terror campaigns by the PKK and its affiliated groups in addition to Bashar Assad and DAESH with the five-year civil war in its southern neighbor Syria, Israel also recognizes the growing and deepening threat from DAESH for the country and the region as a whole, as DAESH has already become established in Syria to Israel's north. Against the escalated surge of terror, Ankara reiterates that it is determined in the fight against any terror without any "our terrorist, your terrorist" understanding, and with this perspective, the country wants to play a role in facilitating peace in the region. "Turkey still has good communication channels with important actors in the Middle East such as Saudi Arabia and Iran, but it has to rebuild its connections with Israel and Egypt if it wants to completely fulfil its potential as a regional power," Gallia Lindenstrauss, a research fellow at the Institute for National Security Studies in Tel Aviv, said. Regarding Turkey's position in the region, she also said that "such communication channels have only become more significant following the Arab upheavals and not less significant." Nimrod Goren, chairman of Mitvim, the Israeli Institute for Regional Foreign Policies, pointed to the unification process on Cyprus and the necessity to restore constructive political dialogue between Turkey and Egypt. "For Israel, it will be good to have Turkey get closer to the countries of the Eastern Mediterranean, some of which are currently concerned with Israel-Turkey reconciliation due to their differences with Turkey. The Eastern Mediterranean can and should become a zone of cooperation and win-win policies rather than a zone of conflict and zero-sum diplomacy," he said. The 67-year history of bilateral ties started in 1949 when the two countries encountered rising threats to their national security in the region and a development in relations was sought. The same scenario might be witnessed now in a time in which both countries suffer from terror as well. Historical experience has proven the two countries have struggled together against different threats in the region or, at least, have broken the ice following several tense periods. Turkey's relations with Israel have never been independent from its ties with Western countries under the scope of NATO and Arab states. Although among the 13 countries that voted against the U.N. Partition Plan for Palestine in 1947, Turkey later recognized Israel on March 3, 1949, 10 months after the country was established. Concerning these initial contacts, the Turkish president at the time, İsmet İnönü, is described in the Israel State Archives of Prime Minister's Office as the "father of the relations." The first major crisis in bilateral relations rose with the threat from pan-Arabism led by Gamal Abdel Nasser in Egypt, especially after Israel's Sinai campaign backed by Britain and France. Nasser's constant threats to Turkey and its pro-Western partner Iraq in the Baghdad Pact caused Turkey to downgrade its relations with Israel from minister to charge d'affaires. Only 45 days later, however, following a pro-Nasser coup in Iraq in 1958, a secret meeting between then Turkish Prime Minister Adnan Menderes and Israeli Prime Minister David Ben Gurion together with top-diplomat Golda Meir, became the precursor to a new era in bilateral relations. To keep the meeting a secret, two Israeli officials were even delivered to a plane to land at Ankara in an ambulance for security reasons after arriving at Istanbul's Atatürk International Airport. In the meeting, Israel took the first step to form a peripheral pact in the region together with Iran and Ethiopia. According to the agreement, which would remain undisclosed for many years, the two sides initiated security and intelligence cooperation alongside other areas of collaboration in unity against Nasser's pan-Arabist policies. 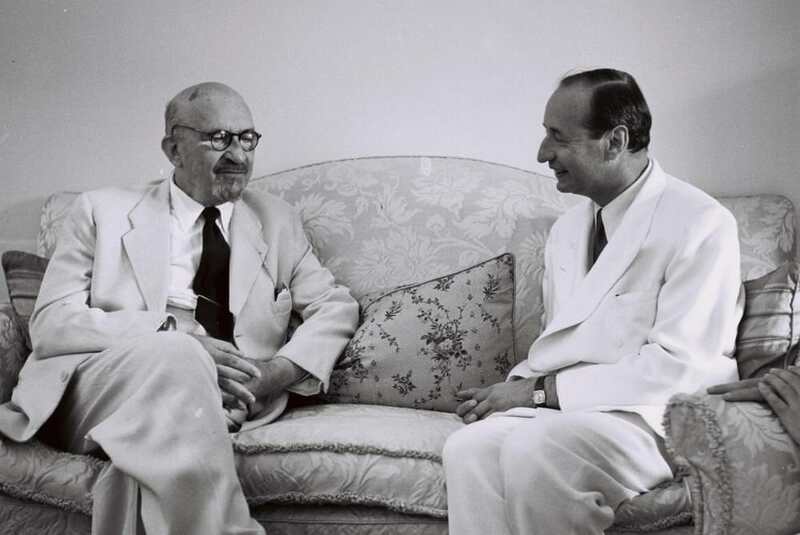 Israel's first President Haim Weizman (L) and Seyfullah Esin, the first Turkish envoy to Israel after the accredition ceremony in Rehovot on July 3, 1950. Israeli Foreign Minister David Levy (L) shaking hands with his Turkish counterpart Tansu Çiller after signing an agreement during his visit to Ankara on April 9, 1997. During Turgut Özal's time as prime minister between 1983 and 1991, Turkey managed to juggle ties with the Palestinians and Israel. Despite condemning the Sabra and Shatilla Massacres that occurred in 1982 and establishing good relations with the Palestinian Liberation Organization (PLO), the growing threat from the Armenian Secret Army for the Liberation of Armenia (ASALA) and the PKK starting a conflict that would continue for more than three decades led to a turning point in security and intelligence cooperation with Israel. Even with right-wing Likud as the ruling party of Israel, none would be worse off for keeping this level of cooperation. Furthermore, Israel starting a peace process with the Arabs in the 1991 Madrid and 1993 Oslo Accords was welcomed by Turkey and encouraged Ankara to take more solid steps to develop relations. Following the two countries' presidents' reciprocal visits, both the Military Training and Cooperation Agreement and the Defense Industrial Cooperation Agreement were signed in 1996, paving the way for annual meetings between the two countries' intelligence officials, especially regarding handling the PKK. As a symbolic figure of the army at the time, Deputy Chief of Staff Çevik Bir with Israel Defense Ministry Director-General Major General David Ivri, who were the pioneers of these bolstered ties. This cooperation reached a peak with the capture of PKK leader Abdullah Öcalan in 1999 thanks to help from Israel's Mossad. The close ties inherited from the previous decades were protected as the Justice and Development Party (AK Party) came to power in 2002, although several crises and bilateral rows were also experienced. Contrary to stereotypical comments labeling the AK Party as Islamist, Ankara continued to bolster ties with Israel and it began to play a mediatory role in peace talks between Israel and Syria. Yet, the Cast Lead Operation to Gaza in 2008, which started a couple of days after then Israeli Prime Minister Ehud Barak's visit to Turkey and meeting with then Turkish Prime Minister Recep Tayyip Erdoğan, became the first spark in the downfall of relations. With the "one-minute" incident in Davos, in which Erdoğan walked off the stage after a heated exchange with then Israeli President Shimon Peres after a panel discussion on Gaza, together with the January 2010 incident when Danny Ayalon, the Israeli deputy foreign minister, publicly humiliated Turkish ambassador Oğuz Çelikkol during a press conference at the Knesset, relations rapidly deteriorated. With the Mavi Marmara raid in 2010, which left 10 people dead and 55 wounded after a flotilla organized by the international Free Gaza Movement and the İHH Humanitarian Relief Foundation İHH was raided by Israeli forces in international waters, relations were downgraded to charge d'affaires. Arab uprisings in the following year and the dramatic changes shaping the region's future took a negative turn when the civil war erupted in Syria. As the war-torn country continues to see many global powers and regional actors conduct proxy wars, DAESH still remains the most serious threat to all parties. Ankara continues to highlight the threat from the PKK and its Syrian affiliate Democratic Union Party (PYD). The PYD plans to expand its territory throughout northern Syria, leading Ankara to regard its efforts as a threat to its national security. In such an atmosphere, Ankara might try into re-establishing cooperation in terms of intelligence and security, and the tragic event in Istanbul last week could be the point for seeking further rapprochement with Israel. Although Lindenstrauss pointed out that reciprocal mistrust still exists and can burden future cooperation, she said that the DAESH attack in Istanbul required collaboration between both sides, and Israeli representatives gave the matter considerable attention. "The further inquiry into the circumstances of this event, for example, whether Israelis were specifically targeted in the attack or just unlucky bystanders, can perhaps serve as a micro test of the potential for better cooperation between the two states." Speaking to Daily Sabah, Turkey's ambassador in Tel Aviv before the Mavi Marmara raid, Çelikkol, said that such cooperation has always existed and that it is difficult to imagine it being terminated completely. "This [cooperation] can continue; there is no problem in it. However, we have to mention that there is a normalization process of relations and it is greatly desired. There were several conditions from Turkey and some of them have been met." Ankara insists that all of its conditions must be met, including ending the Gaza blockade and compensation for the Turkish activists killed in the Mavi Marmara raid. The only condition that Israel has satisfied so far came when Israeli Prime Minister Benjamin Netanyahu apologized for the raid in 2013.Çelikkol, who is also the author of the book "One Minute'ten Mavi Marmara'ya: Türkiye-İsrail Çatışması" (From One Minute to Mavi Marmara: The Turkey-Israel Conflict), stressed that balances in the Middle East are changing with Russia's military presence in Syria, something that really greatly Turkey and Israel, with a normalization of relations being crucial considering the circumstances. "The first step of this would be appointing ambassadors and maintaining relations from this level. This is an obligation." Regarding relations, Lindenstrauss also said: "Normalization in relations between Israel and Turkey can also mean a return to greater NATO-Israel collaboration, and this can have an indirect and positive effect also on Turkey's security." Goren thinks that cooperation should extend further than it has done so before. He said: "The cooperation between the two countries should go beyond the security realm. It should also include economic cooperation – especially in regards to the Eastern Mediterranean natural gas – more extensive interactions between civil society, journalists and academics as well as increased Turkish involvement in efforts to promote Israeli-Palestinian and Israeli-Arab conflict resolution."